Einsteinium, named after theoretical physicist & Nobel Prize winner Albert Einstein, is a synthetic element that is highly radioactive. It is produced by bombarding plutonium with neutrons. It was discovered in 1952 after two teams examined the debris of the first hydrogen bomb test. 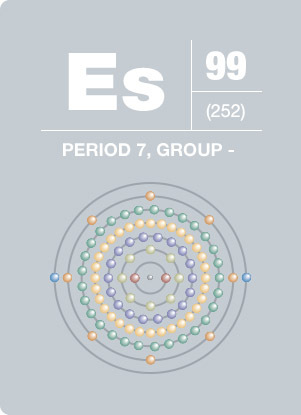 They found that einsteinium-253 was made by the nuclear fusion of 15 neutrons with uranium-238. Because of the tensions of the Cold War, these results were kept secret until 1955. In 1961, a sample weighing 0.01 mg of Es-253 was synthesized.